We are no longer soliciting new characters for the game, but if you want to submit your own finished player we'll put it in. We have some finish work and two more characters to put in yet but the game is more-or-less completed right now. - We are planning on one last release after this (Maby more if we feel like it). The game needs proper ending credits and some finish work on a couple characters. - To see shooting work, use 'dosman' and hold "Back & Punch". - We've been having problems with Mugen exiting with the error "Could not find stage random". I think we have this fixed now, but if you encounter this please let us know. .04Beta - Yea that's right, it's Beta now! FAQ: Notafighter? What is this non-sense? Notafighter was the codename for this game during development. 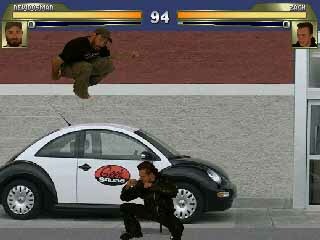 It is a game similar to Mortal Kombat using real life characters from Notacon and other places. We had a goal of finishing by April 2006 and unveiling at Notacon 3 in Cleveland Ohio (Goal achieved). Who will see it? How will it be distributed? What's in it for me? It will be available for play by Notacon attendees and we will have it available for download after Notacon 3 is over. Your reward is that of being immortalized in gaming history for eternity. 1. Get still images of you doing the moves. There are several ways to do this, but we might recommend using a digital camera. You can use a video camera and export to stills, but taking each frame manually will result in much less leg work for yourself (10-30 images per second is way overkill for this project). It doesn't have to be super fancy, the final sprites you'll be making out of the pictures are in the neighborhood of 150x100 pixels. However this is still plenty enough quality to recognize people's faces. The nicer the photo's are to start with the clearer your character will be in the game. 2. Take profile pictures against a bare wall with a floor that matches the wall color. Putting a white bed sheet down on the floor works well for white walls. The wall color doesn't matter, as long as the floor matches and as long as there is plenty of contrast between you and it. In fact, if you have access to a blue screen to take photo's against that is what's needed, but if not this will due. Remember, each picture has to be cut out and 'blue screened' individually. The more you can do to contrast yourself from the background the less work it will be to cut the background out of your photo's. What we found out is that unless you have a perfect blue screen to shoot against you're pretty much going to have to manually blank out the background for each photo. We did about 600 images total this way for our 8 characters in this game. 3. Wear dark clothes if possible. If you want to wear light colors or even white, you will need to make your backdrop or wall dark to contrast against you. Doesn't really matter, see #2 above. 4. Get more light! Make the room as bright as possible, bring in any extra lamps you can and shine them on you. If you have a white backdrop shine a light on it also to help reduce shadows behind you (Backlighting). 5. We recommend using a whiteboard or something to separate and label each group of actions (See this picture). This makes it much easier for you and us to tell what you are supposed to be doing in each set and where actions start and stop. 6. Face the right side of the photo. Be conscious of where your feet are, try to keep them in the same place for as many moves as possible, this helps keep transitions between moves look more fluid. In fact, it might help to mark the floor with masking tape. 7. Each character should have at least one special move or cheating move. The game works pretty much like any other fighting game so use your imagination. However, just remember we are still reverse engineering some of the more complex moves so don't expect to do a Tarzan swing across the screen or anything like that unless you can code that yourself. Things like pulling knives, ISA cards, throwing computer parts and the like are easy to setup. Talk to us if you have any questions. 8. When completed you should have somewhere in the neighborhood of 130-200 photo's (A basic character can still be made with 3-20 photos). If you can help us by cutting the background out of them it would be tremendous. If you don't have time, we'll take care of it though, we're just glad to have you contributing your likeness :) Basically, the entire background needs to be wiped out and replaced with a pure color. However, please read the Mugen character tutorial before you try to do this, this MUST be done according to their spec or Mugen won't like your photos. Here is a tutorial we have written to help if you can do your own photos. 9. Get the pictures to us. We'll give you an ftp server to upload them to once you let us know you are ready to send them. 10. Have fun! Some of the actions may require a little thought. When doing 'jumps' and such, just crouch closer to the floor in each frame. Remember, each pic will be bluescreened so the floor will be invisible in the final result. Sounds - especially for the intro, winning move, and taunt, but also grunts and whatnot for getting hit or thrown. Raw wav's will be fine for these, please keep them manageably short if at all possible. Special Moves - See the MortalKombat port to see what all is possible with this engine, basically anything. We're asking that you keep it down to 1 or two special moves unless you've cleared it with us first. Example of pictures needed. Note, don't thumbnail them like this for sending, this is just an overview of the different types of pictures we need. We'll need the full size photo's for the game. What else do you guys need? Photo editing! The most time consuming part of this project is photoshoping the pictures. If you can do your own, great! If you can build your own character, even better. If you can finish your own character and start doing other people's, we'll buy you beer at Notacon! However, we'll gladly accept your unedited photo's, we're just glad you want to participate! We also need more stages. Since we're using real people, real back alleys and interesting places for fighting will make it more interesting. The geekier the better. Panoramic pictures are the best, if you can walk down a street and take several photo's to be stitched together that is really what we need. Remember that the players in the game can walk/scroll pretty far left and right on the the screen. How where you able to do this? We used the fighting game creation system known as Mugen to do this. Most of the 'hard-work' has already been done for us, we are merely creating new characters and re-working the look and feel of the game for our needs. The company that made this engine has gone under but a huge user base has grown up to support it. The Mugen Fighters Guild is an active message board community supporting Mugen. If you have ANY questions please don't hesitate to contact us, we'll help you in any way we can. Don't forget our photo editing tutorial. Q: Why are you tards developing on Windows/DOS? A: Fine, here's your Linux Mugen. Now go re-compile something. We did this because it was fun, why else?